In the Buddhist art of China and North Asia, Maitreya is represented as both a Buddha and a Bodhisattva. The Historical Buddha, Shakyamuni, is said to have visited Maitreya in the Tushita heaven when he appointed him to be his successor. For this reason Maitreya is also known as the 'Future Buddha'. In later times and in yet another form, Maitreya became one of the most popular of Buddhist images as Budai, the manifestation of the Future Buddha: always represented as a fat jolly fellow commonly referred to as the 'laughing Buddha'. Here Maitreya is represented as a Bodhisattva, identified by the hands held in the dharmachakra (teaching or turning the wheel of the law) 'mudra', with the legs pendant: the only deity in the vast pantheon of Buddhist gods to be shown seated in the European manner. Also visible are the now broken stems of the lotus flower traditionally held by Maitreya. The ornate 'dhoti' tied at the waist and elaborate necklaces, headdress and jewellery are all characteristic of Bodhisattva images of this time, when the influence of the Tibetan style was being felt. Art Gallery Handbook, 1999. pg.251. Edmund Capon, Look , 'The Arts of Asia', pg. 20, Heidelberg, Apr 1997, 24 (colour illus.). Bruce James, Art Gallery of New South Wales handbook , 'Asian Collection: East Asia', pg. 246-287, Sydney, 1999, 251 (colour illus.). Judith White, Look , 'A landmark for the city', pg. 16-19, Melbourne, Apr 2001, 17 (colour illus.). 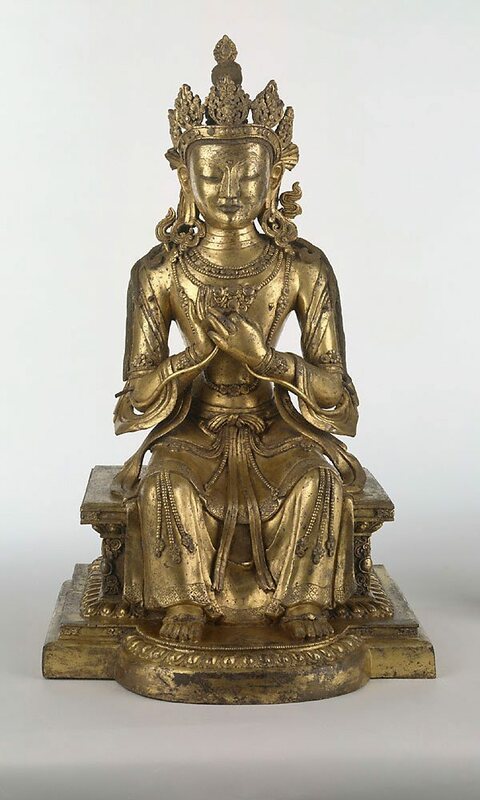 In this publication this object is titled 'Figure of Maitreya'. Gold and civilisation , Canberra, 2001, 191 (colour illus.). The arts of Buddhism , Sydney, 2001, back cover (colour illus.). The Asian Collections Art Gallery of New South Wales , China 'Buddhist Art', Sydney, 2003, 98 (colour illus.). The Art Gallery of New South Wales Bulletin , 'The Collections', pg. 44-45, Sydney, Feb 1997-Apr 1997, 45 (colour illus. ).